What would my life be like without Jane Austen? Several writers, including myself, explored this question in honor of Jane Austen's birthday yesterday. Head on over to My Jane Austen Book Club to check out our answers and to enter a HUGE giveaway. Austen in August is almost here! It's that time of year again: Austen in August! Giveaways, chats, best-of lists, read-alongs, movie-viewing parties, and more! It's like a two-week slumber party where it's all-Austen-all-the-time, and you don't even have to leave your computer. Want to join the fun? Head on over to The Book Rat to see the official invitation. You can sign up now if you want to contribute a guest post, giveaway, or other fun stuff. Or you can just visit The Book Rat from August 18-31 for daily Austen activities and freebies. I'll be posting and giving away books, along with lots of other Austen lovers. See you at Austen in August! Jane Austen’s Pride and Prejudice . . . Timeless. Get ready to celebrate the 200th anniversary of one of the most famous, beloved, and adapted novels in the English language at a new site dedicated to news about bicentenary events all over the world. My story INTOLERABLE STUPIDITY made Becky's Book Review's top five short stories for 2012. Woohoo! Check out my new Tumblr. It's another fun place to visit, and the perfect place to showcase pix like this one. Austen in August is here, with loads of giveaways, discussions, guest posts, and awesome fun, like this Austen bad boys smackdown. The Book Rat is hosting a read-along of my favorite Austen novel, PERSUASION, as part of its Austen in August extravaganza. Sign up and join the fun! 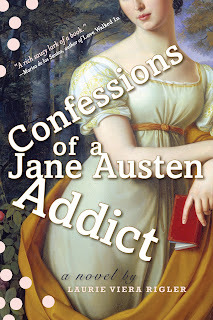 Viewing parties, discussions, guest posts, and giveaways abound at Austen in August! Lately I've been looking through some of my posts tagged "Writing Life," and found a few favorites. Welcome reminders as I write my next two novels. May these pieces help support you on your own writing journey! Downton Arby's: Once is not enough. From the producers of Sonic and Sensibility and Pizza and Prejudice comes the LOL parody of the latest period drama addiction sweeping the nation. If you haven't seen it, you're in for a treat. If you have, it gets even better with age. Unleash the dastardly drive-through duo! And break out the horsey sauce! Reading for your book club and socializing with your group members is a lot of fun, but sometimes it can be tricky to find a book that no one has read yet and everyone will enjoy. Maybe you’ve already read The Help, The Lovely Bones, Water for Elephants, Cutting for Stone, The Guernsey Literary and Potato Peel Pie Society . . . and you’re looking for books that go beyond the obvious picks (as much as we love those tried-and-true book club favorites). Very proud to see one of my novels on a list with books by Haruki Murakami (reading his 1Q84 and completely entranced), Jonathan Tropper (loved his HOW TO TALK TO A WIDOWER), and many other excellent storytellers. I have just increased my to-be-read list considerably, thanks to Book Page.